I've had this plant for over 45 years and the first time it bloomed I was astonished. I had always wondered why the fabric, persian print, had the design of purple leaves with orange tasseled flowers, thinking it clashed. When the plant bloomed I saw that the fabric was merely imitating nature, and nothing in nature clashes! 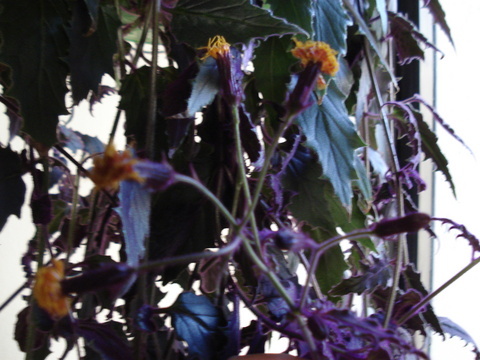 In all these years I"ve only had the purple passion plant bloom about 4 times and this month is the 5th. It feels like a special blessing. It reminds me of Colette's autobiography when she wrote about a long awaited visit from her mother who cancelled at the last minute because a rare plant in her garden was about to bloom. The miraculous appearance of my purple passion flowers--the only little branch of blooms on the huge plant--helps me to understand Colette's mother's priorities a bit better.